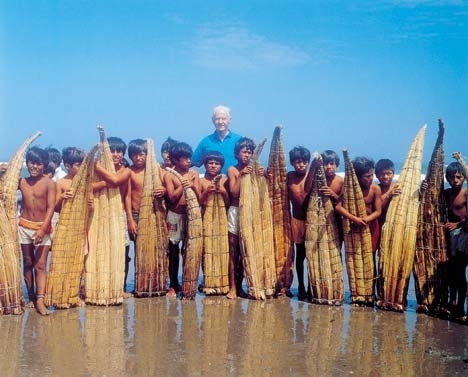 Above: Thor Heyerdahl with Peruvian children who still construct traditional boats made of reeds, the principle material that enabled early migrations on trans-oceanic voyages. Courtesy: Thor Heyerdahl. 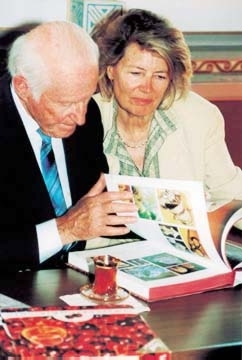 Archeologist and historian Thor Heyerdahl, 85, has visited Azerbaijan on several occasions during the past two decades. Each time, he garners more evidence to prove his tantalizing theory - that Scandinavian ancestry can be traced to the region now known as Azerbaijan. 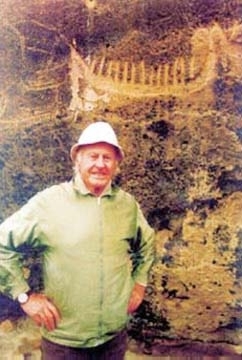 Heyerdahl first began forming this hypothesis after visiting Gobustan, an ancient cave dwelling found 30 miles west of Baku, which is famous for its rock carvings. 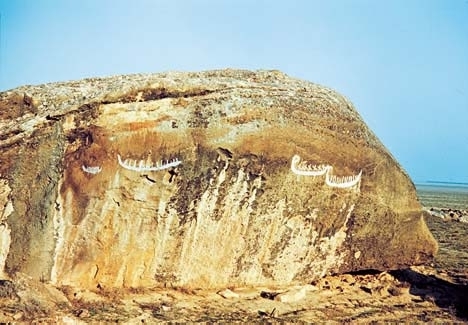 The sketches of sickle-shaped boats carved into these rocks closely resemble rock carvings found in his own native Norway. Years later, the explorer stumbled upon another correlation between Norway and Azerbaijan. Norwegian mythology tells that the Scandinavian god Odin moved with his people to Norway from a land called Aser, in order to avoid Roman occupation. A 13th-century historian's description of Aser's origination matches that of Azerbaijan: east of the Caucasus mountains and the Black Sea. Is this story mythology or history? During his most recent visit to Azerbaijan in May 1999, Heyerdahl elaborated his point of view at a public forum. Here is his speech with personal notations added by Heyerdahl himself just prior to our going to press. 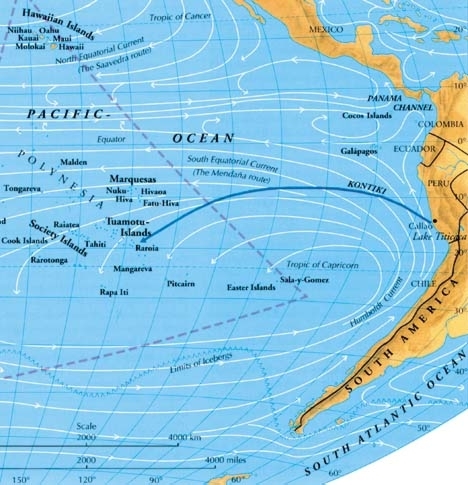 Above: Heyerdahl's route that he made with a balsa wood raft Kon-Tiki in 1947 to prove that early transoceanic migrations were possible. Source: "Thor Heyerdahl, the Explorer", Oslo: J.M. Stenersens Forlag, 1994. I think as science advances, it will become more and more evident that we have more in common with each other than any of us realized a few decades ago. This afternoon I visited the Gobustan caves. From the first time I saw the carvings out there [several years ago], I was attracted to the petroglyphs that feature reed ships. On the way back from Gobustan, I was told that I was supposed to speak tonight. I was told that I should speak about my relationship with Azerbaijan and how it began. I had barely half an hour to prepare myself for this topic, but I hope you will give me half an hour so I can tell you what I've been thinking. The first time I came to Azerbaijan was in 1981 [He also visited in 1994, 1997 and 1999]. There weren't very many visitors from outside the Iron Curtain who came here back in those days. My invitation came from Azerbaijan's Academy of Sciences. I started thinking about why the Academy of Sciences in Azerbaijan would invite me and it dawned on me that I was in a very unique situation at the time because I was both a member of the New York Academy of Sciences and had received an Honorary Doctorate from the Soviet Academy of Sciences. I didn't believe in barriers between nations. I believed in people, not political parties. Above: In the ancient caves of Gobustan which date back at least 5,000 years, cave drawings depict two different kinds of boats that were used for early navigation. Heyerdahl is convinced that people living in the area now known as Azerbaijan settled in Scandinavia around 100 AD. Gobustan is located about 30 miles southwest of Baku. At that time I was fighting with scientists all over the world - both in the East and the West - because I believed that there had been peaceful contact between nations much longer than we, who consider ourselves civilized, ever realized. I believe there was contact by ships along the rivers and oceans long before civilization began. Earlier this century, nobody believed that people could navigate with the kinds of vessels that men were using 5,000 years ago. So I was fighting with scientists from all over the world - on both sides of the Iron Curtain - for my theory of ocean migration. I spent most of my time answering attacks in scientific publications. I had friends in Russia who sent me translations of these attacks. I answered back and my defense was published in Russian. Of course, it took quite a bit of time. Above: Roman inscription at Gobustan indicating that Roman troops were in the region around 97 AD. One day I received a very surprising letter from Professor Keldish, President of the Soviet Academy of Sciences in Moscow. He was quite famous on both sides of the Iron Curtain as he had sent the first Sputnik into space. He invited me to come to Moscow and defend my own theory in front of the Soviet scientists. I accepted the invitation and went alone to Moscow. It was a great moment for me to address the entire Academy, in a part of the world that was not very popular in my part of the world at that time. President Keldish himself organized the questions and it was a very fair and honest discussion. Before I left, I was given an Honorary Doctor's Degree from Lomonosov University in Moscow. Doctor Keldish asked me: "Why don't you collaborate with Russia and people from the Soviet part of the world in some of your expeditions in the future?" Now let me explain my own background as a scientist, because it wasn't everyone that President Keldish invited to come to Moscow. The reason was boats like those carved on the cave walls in Gobustan. I had been educated in Oslo University in biology. As a student, I went on an archeological expedition to an island in the middle of the Pacific called Fatu-Hiva in Polynesia. I was to study how life had arrived at this island, which had come straight up from the bottom of the ocean. Millions of years ago the island had just been boiling lava. But when the first European explorers came, there were all sorts of plants and animals and even human beings. Of course, the study of zoology includes human beings as well. This was back in 1938. It caused me to wonder: how did early people travel across the ocean? Europeans never discovered a single uninhabited island in any ocean. Every single island that could have been inhabited already was. All the thousands of islands in the Pacific and also all those in the Indian Ocean were populated. The islands in the Atlantic - the Canary Islands and the Caribbean Islands - were also populated. And so this is how I became interested in early navigation. Scientists at that time insisted that no American Indian could have left America before Columbus, and no people could have reached America before Columbus except via the Bering Straits in the Arctic. This is where I learned how important it is for scientists to collaborate across different branches of science. I had my university training in biology, geography and physical anthropology. I had biological proof that someone must have brought certain plants from South America to Polynesia - for instance, the sweet potato, which only grew in South America. It could not have drifted alone across the ocean without the help of man. Historians and anthropologists told me that in South America they had only rafts before the Europeans came. And so that's how I decided to construct a raft like I imagined the South American Indians had done, and sail with friends from Peru to Polynesia. This voyage on the "Kon Tiki" in 1947 was my first experience with a small vessel on the open ocean. From then on, I began organizing archeological excavations. My first was in 1952 to the Galapagos Islands. The next was to Easter Island in 1955-56. That was the first time I saw carvings of those large sickle-shaped ships. They were the same type as those in ancient Egypt and Mesopotamia. I started to suspect that people of early civilizations in North Africa might have been able to cross the Atlantic long before Columbus did. We Europeans usually think that we have discovered everything, but that's not correct. We're realizing that everywhere there were people who came before us. My anthropological training has made me understand more and more how much alike people are, regardless of nationality, race or physical features. I've also come to the conclusion that we err if we believe that we are much different from people who lived 5,000 years ago. I think that we can say with assurance that we are born with the same genes as people 5,000 years ago were. We start at zero for each new generation. We accumulate technical knowledge, but our intelligence or mental characteristics don't change. With this in mind, I came to the conclusion that the Egyptians who built the pyramids left behind art and technology of an incredibly high level. They would not have continued to build boats made of reeds if they had considered such vessels to be primitive and ineffective. So, I decided that there must be something wrong with our scientific theories. All the literature that I had read at the university had said that boats made of balsam wood would absorb water and sink. So I went on to prove that these scientific theories were wrong. 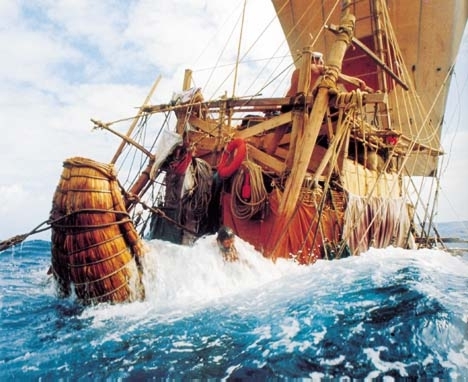 The Kon Tiki raft kept afloat for 101 days until we arrived in Polynesia. In Egypt it was said at the Papyrus Institute that papyrus reed would absorb water and sink after two weeks. Again, I decided to trust the ancient pharaohs more than modern scientists who have never even seen a papyrus ship. That's how I came to build my first reed boat. Together, with an international crew of seven people, we sailed for two months. The reed boat was still afloat. The Buduma fishermen from Lake Chad in Central Africa, who built this reed ship, were not used to ocean waves. The rope lashings busted and we started losing reeds. The problem was that half of the reeds were not floating with the rest of the ship. We were sitting there watching the reeds float behind us. When we arrived off the coast of the U.S., I decided that we should not take any risks with human life, but we should try again. For one month we had been swimming underneath the vessel and trying to tie it back together with ropes. In the end we had 17 sharks swimming alongside us, so we had to discontinue our repairs. So I told my men, "Are you going to come? We'll start again next year." So we attempted to make the trip again and crossed the Atlantic from Morocco to Barbados in 1970, with the papyrus ship Ra II and with all the same crew, plus a Japanese cameraman. On both these Atlantic trips, I experimented not only with the vessel, but also with the crew. I mixed people - black as black as you can get, with yellow and white - along with representatives of all the existing main religions, including atheism. There was one person from North America and one from Soviet Russia, one Arab and one Jew. We lived together so well that they all came with me again when I sailed another reed ship in the Indian Ocean in 1977-78. That reed ship, the Tigris, was larger, which made room for more nationalities. We sailed down the river Tigris up to the Persian Gulf, up to Pakistan, the Indus Valley, then reversed our direction and sailed across the Indian Ocean and came back to the entrance of the Red Sea, where we could meet the modern world. The 11 of us were from 11 nations, from all different political inclinations, all major religions, and we all lived together in peace for five months in the tight quarters of a reed ship. We received messages from the United Nations that we shouldn't push any further because there was a war being waged on both sides of the Red Sea, where millennia ago peaceful Sumerians and the people from the Indus Valley had traded with Egyptians. We sent a telegram to the United Nations and recommended that they halt weapons delivery to people who had been fighting only with swords until Westerners had come and were making profit from perpetrating wars more catastrophic than ever. And so, after those three expeditions on three different oceans, I was invited to visit Azerbaijan. I came here because I had established good contacts with scientists in this country, and I had learned that you had something quite sensational at Gobustan. I came to Azerbaijan as a guest of the Academy of Sciences in Azerbaijan to see the petroglyphs in Gobustan. The President of the Academy was driving around with me to see this country and its beautiful nature and to meet local people - scientists as well as farmers. I learned about his family connections the day before I left - he was the brother of the President of Azerbaijan. That's how my friendship with your country started. Due to this friendship that I have with Azerbaijan, when Statoil from Norway came here, I was invited to join the delegation because I knew so many people here. And that's when I became interested in the fact that you have two types of boat petroglyphs in Gobustan. We learn of the line of royal families in Denmark, Sweden and Norway. But we didn't take these stories about our beginnings seriously because they were so ancient. We thought it was just imagination, just mythology. The actual years for the lineage of historic kings began around the year 800 AD. So we learned all the kings in the 1,000 years that followed and did not interest ourselves in earlier names. Snorre said that the homeland of the Asers was east of the Black Sea. He said this was the land that chief Odin had, a big country. He gave the exact description: it was east of the Black Sea, south of a large mountain range on the border between Europe and Asia, and extended southward towards the land of the Turks. This had nothing to do with mythology, it was on this planet, on Earth. The Romans are human beings, they are from this planet, they are not mythical figures. 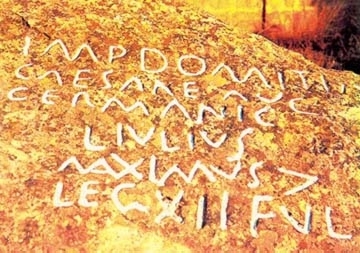 Then I remember that when I came to Gobustan, I had seen a stone slab with Roman inscriptions. I contacted the Academy of Sciences of Azerbaijan. I was taken to the place, and I got the exact wording of the inscription. There's a very logical way of figuring out when this was written. It had to be written after the year 84 AD and before the year 97 AD. If this inscription matched Snorre's record, it would mean that Odin left for Scandinavia during the second half of the 1st century AD. Then I counted the members of the generations of kings, every king up to the grandfather of the king that united Norway into one kingdom, because such information is available - around 830 AD. In anthropology we reckon 25 years per generation for ruling kings. In modern times, a generation may extend up to 30 years, but on average the length of a generation in early reigns is 25 years. When you multiply 31 generations by 25 years, you come exactly back to the second half of the 1st century AD. So there is proof that these inscriptions carved by the Romans in stone coincide with the written history written almost 1,800 years ago in Iceland. We all know that the Northern people are called Caucasian. Here is where history, archeology, geography and physical anthropology come together. The more I research the topic, the more evidence I find that this part of the planet has played a much more significant role than anybody ever suspected. I am working on a book at present together with a colleague, and we are halfway through it describing our observations. In the meantime we have contacts with the Academies of Sciences in 11 nations. We do not want to leave anything out. The most surprising discovery was when we contacted Communist China. They had discovered blond-haired mummies in the Karim Desert deep inside China, so perfectly preserved in the cold climate and salty earth that you could see the color of the skin and hair. The Chinese archeologists were surprised because these mummies were not Mongoloids at all; they suspected instead that they were Vikings. But it didn't make sense to me that Vikings should be deep inside the deserts of China. When the Chinese archeologists conducted radio-carbon dating, they determined that the mummies were of Nordic type dating from 1,800 to 1,500 years BC. But the Viking period started around 800 AD. It then became obvious that these mummies were not Vikings who had come to China. Here was a missing link. And again the Caucasus enters into the picture as a mutual migratory center. But this is not the end of the story. These mummies were dressed in cloth that had been woven, and the colors and the woven pattern were of a very specific type. The Chinese themselves studied the mummies and then invited American experts to study the clothing who determined that the weave and coloring were typical of the Celts of Ireland. But this made no sense at all. Then we contacted Ireland to get their sagas, and their written saga says that their ancestors were Scythians. So, again, their roots come back here to the Caucasus. This is only the beginning, because this is as far as we have obtained documentation from the Academies of Sciences with which we are in contact. I will not go into detail further, but I have also found archeological evidence that is so striking that there can no longer be any doubt. My conclusion is that Azerbaijan has been a very important center, sending people in many directions and attracting people from many directions. You have had metals that made the Romans want to come here. But you have been very central in the evolution of civilization, and more than anything, this is proven by the petroglyphs in Gobustan. One thing is clear: navigation occurred before civilization. We used to believe that civilization came first, and once people had developed a high enough level of civilization, then they started to build boats. This just isn't true. On the contrary, it was when people built ocean-going vessels - that enabled them to contact each other so that they could trade and learn from each other. It was through contact and peaceful cooperation that civilization developed.